Gemini Lake Castle is one of the residential development of Gemini Infra, located at Pragathi Nagar, Kukatpally, Hyderabad. It offers spacious and skillfully designed 2BHK and 3BHK flats. The project is well equipped with all the amenities to facilitate the needs of the residents. What size of flats are available in Gemini Lake Castle? The apartment sizes in the project vary from 1224.0 sqft to 1535.0 sqft. 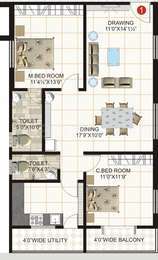 What is the area of 2 bhk in Gemini Lake Castle? The size of a 2BHK unit in the project ranges from 1224.0 sqft to 1243.0 sqft. 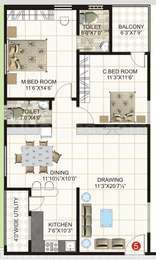 What is total area of 3 bhk in Gemini Lake Castle? 3 BHK units in the project are available in a size of 1535.0 sqft. Does Gemini Lake Castle have cricket pitch? The project doesn't offer a cricket pitch. Does Gemini Lake Castle have lawn tennis? The project doesn't have lawn tennis. RCC Framed Structure with M20 Grade Cement Concrete. External & Internal plastering with putty/Luppam finish. 1. Vitrified tiles flooring of 2'0" x 2'0" size for hall, dinning and bed rooms. 2. Ceramic Tiles for bath room. 3. Parking area floor with interlocking / parking tiles. UPVC / Teak Wood framed fully glazed shutters with glass & MS grills. All hardware of stainless steel. Powder coated. Inside smooth finish with emulsion paint. Pls mention various floor plans offered by the builder? How is the transportation network in the area? KR Puram is well connected to different parts of the city. Over thee last few years, there has been an increasing demand for residential projects because of good civic infrastructure. Hi, how is Pragati Nagar, Hyderabad area and connectivity to this area ? Is it a good place to invest with ? Hi Suresh, this area is well developed and you will find a great connectivity here. Commuting from here will not be a task as various means of public transports are available here.